As pilot error looms as a possible cause of the deadly Asiana Airlines Flight 214 crash earlier this month, former Asiana aviators and trainers say the airline's Korean pilots lacked extensive training on how to fly planes manually. "This" would be flying without automation, according to Bloomberg. Three former aviators and trainers who spoke with the newswire say that Asiana's Korean pilots were well-trained on flying with automated systems, but rarely flew manually. Visual landing is one of the first skills that U.S. pilot trainees are taught, but that's not the case in Korea, they said. Civilians in Korea rarely learn to become pilots because the country doesn’t have the same network of public airports, Aimer said. Most non-military pilots hired by Asiana are sent to flight school by the carrier, he said. Among Korean pilots, even those who flew in the military, comfort with manual flying was unusual, he said. Another retired Delta executive who was hired by Korean Air in 2000 to bolster its safety and pilot training following a spate of fatal crashes said he observed the same phenomenon. However, the story notes that as automated jets become increasingly common, a lack of manual flying skills is becoming an issue globally, not just in Korea. While the accident involved different circumstances, the Air France (AF) pilots who crashed in the Atlantic Ocean on June 1, 2009, killing 228 people, had difficulty flying the plane by hand after a malfunction switched off the Airbus SAS A330’s automation, according to France’s Bureau of Investigations and Analysis. 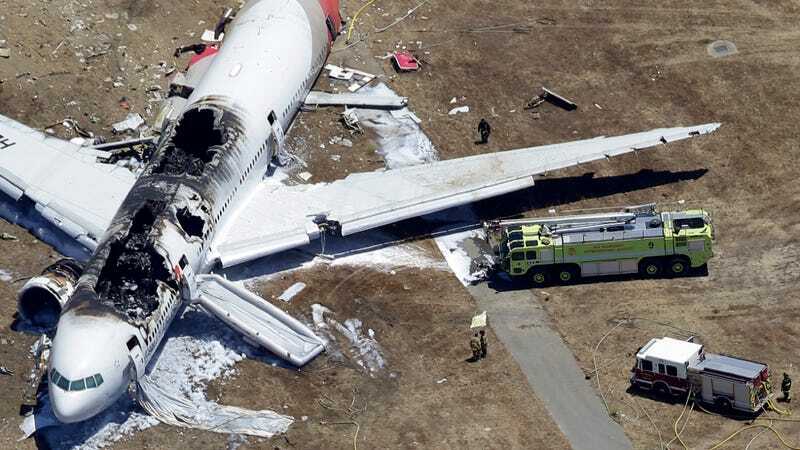 The National Transportation Safety Board chairman said last week that Asiana Flight 214 was coming in too low and was proceeding 40 miles an hour slower than the target approach speed when its landing gear and tail struck a seawall short of the runway, the story says. Despite this, the pilots did not attempt to abort the landing until three seconds before they struck the seawall. Meanwhile, friends and colleagues of Flight 214 Captain Lee Jeong-min have come to his defense and said he was a highly-skilled aviator and former Korean Air Force pilot. The Wall Street Journal (sub req.) also reports that if found to be responsible for the crash, the pilots could face prison time in South Korea. The Korean pilots of the Boeing 777, which hit a sea wall after making a dangerously low and slow approach to San Francisco International Airport in good weather, returned to Seoul on Friday. Before leaving, the pilots told associates they are concerned that their government intends to hit them with criminal charges for lapses in the cockpit. Unlike in the U.S., South Korean law and precedent make that a possibility. South Korean law allows prison sentences of up to three years in the event of pilot negligence. We'll have to wait and see what the actual cause of the crash turns out to be, but it's clear that Lee Jeong-min and his co-pilots — and their skills — will be under scrutiny for some time.